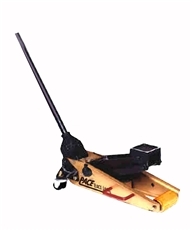 The Argo race jack features an all aluminum construction that is hard coated for wear resistance. This jack provides fast lift, even on heavy cars. It features a 2 1/2" diameter front roller with dual rear casters and three to six pumps to service height. "WARNING: This product contains a chemical known to the State of California to cause cancer and birth defects or other reproductive harm."